Right from the start it was obvious that despite the print media's love affair with these Americans, Anacrusis' career would be short-lived. Constantly publicizing their non-metal preferences and influences, metal fans were left wondering why the gang doesn't simply play Pink Floyd-style pop/rock. 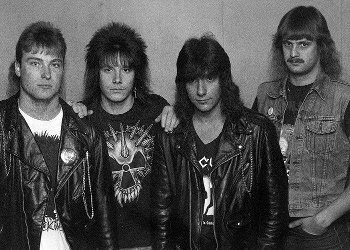 Mixing thrash and technical/progressive sounds, Anacrusis signed to the struggling Active Records and began its career. The band recruited Red hot Chili Peppers drummer Smith who later left the band for financial reasons. The band opened for the likes of Death in Europe and Flotsam & Jetsam in Canada and eventually disappeared. Jeff Carline of Tribes With Knives reportedly passed away in February, 2004 of a heart attack. The band’s 1987 demo, Annihilation Complete, was being released by Stormspell Records in February of 2009. This would be a CD/DVD package featuring the demo and bonus material from the early days. The original lineup of the band - Kenn Nardi, Kevin Heidbreder, John Emery and Mike Owen - were to reunite for an appearance at the Keep It True XIII festival, planned for April 23-24, 2010 in Lauda-Königshofen, Germany. Anacrusis issued the following statement in 2010: "We're finally finishing up recording the final tracks for the 'new' Anacrusis CD. The title of the album will be 'Hindsight: Suffering Hour & Reason Revisited'. The two-CD set will feature both our debut album, 'Suffering Hour', and our second release, 'Reason', along with the classic Anacrusis demo track 'Apocalypse', all fully re-recorded by the original lineup of Kenn Nardi, Kevin Heidbreder, John Emery and Mike Owen. The band exited the stage in the mid-’90s after several years on Metal Blade. The reformed Anacrusis announced a free all-ages show on April 18th at T. Billy Buffett's in Overland, Missouri. This would be the band’s only appearance before its show at Keep It True XIII festival, which happened on April 23 and 24 in Lauda-Königshofen, Germany. After a couple of years’ of sporadic shows, reports of newer songs and a new album Anacrusis went back into hiatus.